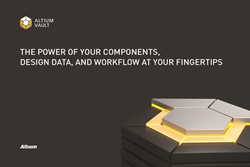 Altium has launched an all-new version of its PCB component and design data management solution with Altium Vault 3.0. As a complement to their leading PCB design software Altium Designer 17, Altium Vault furthers the brand’s commitment to fuelling creativity by giving the engineer more control over their design data. Altium recognized that engineers struggle with the necessary but tedious process of managing design and component data on a daily basis. The reality is most engineers are using outdated, ad-hoc processes to manage PCB design data, which led Altium to dedicate seven years of research and development to design the world’s first data management solution designed specifically with the engineer in mind. Altium Vault 3.0 introduces a secure and centralized system for managing design data that is simple to install and natural to use. Rather than requiring tedious and manual procedures to manage data, Altium Vault utilizes powerful automation technology to make data management simple, and aid the design process rather than hinder it. Engineers can easily find the right parts, apply models to their design, make corrections when necessary, and release verified design content and documentation with a single click of the mouse. Altium Vault streamlines the engineer’s existing workflow by placing verified PCB component and design data directly into their design environment. Engineers can avoid the headache of tracking down parts and capturing design requirements while also ensuring that their designs are equipped with the correct parts. If an obsolete or errant part exists, Altium Vault makes it easy to locate and replace across all library and design instances. With all design and component content securely stored in a single location and used across all projects, designers can release with confidence in knowing that their printed circuit boards have been designed with up-to-date design data. To explore all the new technologies included in Altium Vault 3.0, visit the Altium Vault product page. Altium Vault 3.0 is now available for free trial and purchase. The wide selection of new technologies introduced in Altium Vault 3.0 are available as a free upgrade for existing Altium Vault Subscription customers on the Altium Downloads page. With a unique range of technologies Altium helps organisations and design communities to innovate, collaborate and create connected products while remaining on-time and on-budget. Products provided are Altium Designer®, Altium Vault®, Autotrax®, Camtastic®, Ciiva™, CircuitMaker®, CircuitStudio®, Octopart®, PCBWorks®, and the TASKING® range of embedded software compilers. Founded in 1985, Altium has offices worldwide, with US locations in San Diego, Boston, and New York City, European locations in Karlsruhe, Amersfoort, Kiev, and Zug, and Asia-Pacific locations in Shanghai, Tokyo, and Sydney. For more information, visit http://www.altium.com. You can also follow and engage with Altium via Facebook, LinkedIn, Twitter and YouTube.